See all the Key Notes videos from Global Summit 2018 in a dedicated Global Summit 2018 Keynotes playlist on DC YouTube Channel! 1. Our Investment In the Future – presented by Terry Ragon, CEO, Founder, and Owner of InterSystems. 2. Data Fueling the 21st Century – presented by Paul Grabscheid Vice President, Strategic Planning at InterSystems. 3. InterSystems IRIS: The Engine For Next Generation Solutions – presented by Carlos Kühl Nogueira, General Manager, Data Platform Initiatives, InterSystems. 4. Where Vision Meets Reality - Our Partnership With InterSystems – presented by Vish Anantraman, Chief Information Architect, Northwell Health. 5. Turning Data into Results with InterSystems IRIS – presented by Manoel Amorim, President, Facilit. 6. Accelerating What Matters in Healthcare – presented by @Donald Woodlock, Vice President, HealthShare, InterSystems. 7. Disrupting Healthcare: Clinical Lab 2.0 – presented by Sam Merkouriou, President, Rhodes Group and Steve Ayer, Chief Information Officer, TriCore Reference Laboratories. 8. Creating A High-Performance Organization - Panel Discussion – presented by Tom Keppeler, Director of Communications, InterSystems. 9. Driving High Performance Through Digital Customer Engagement – presented by Ian Bonnet, Managing Director, PricewaterhouseCoopers. 10. What Can a Developer Learn From a Robot to Unlock Creativity? – presented by Gil Weinberg, Ph.D., Founding Director, Georgia Tech Center for Music Technology. 11. Technology Trends on InterSystems IRIS Data Platform – presented by @Jeffrey Fried, Director of Product Development, Data Platforms, InterSystems and @Joseph Lichtenberg, Product and Industry Marketing Director, Data Platforms, InterSystems. 12. How Affective Computing is Changing Patient Care – presented by Rosalind Picard, Sc.D., Founder and Director, Affective Computing Research Group, MIT Media Lab. BIG APPLAUSE TO ALL THE SPEAKERS! 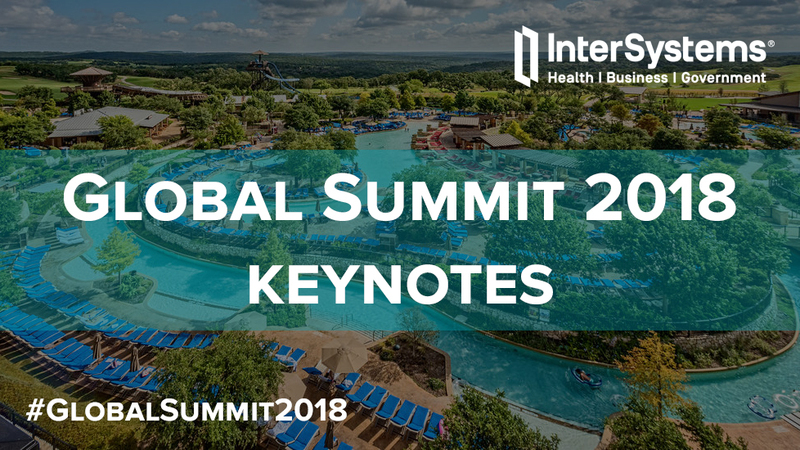 If you want to learn more about Global Summit 2018, follow this link. Enjoy and stay tuned on Developer Community YouTube Channel!